Royal Canadian Sea Cadets is for boys and girls from 12 to 18 years old. Cadets also reap the personal benefits of increased self-confidence, learning how to take initiative and making decisions. Cadets make valuable contributions to Canadian society on a daily basis in terms of environmental, citizenship and community activities and services. The cadet movement is the largest youth organization in Canada. The Royal Canadian Sea Cadets bases its training on maritime subjects, such as seamanship and sailing and history of the Royal Canadian Navy. There area also subjects on such things as marksmanship, outdoor adventure training and leadership. The combined training helps to instil a number of personal skills like initiative, self-esteem, confidence, problem solving skills and awareness of environmental issues. The training year runs from September to June of each year. During the summer months, cadets are selected to attend cadet summer training centres across the county, to take part in various training. Senior cadets have opportunities for exchanges to foreign countries and may also be employed at the training centres. There is no cost to join the Royal Canadian Sea Cadets. All uniforms and learning material is provided free of charge. To join R.C.S.C.C. Repulse, please visit the join us page. Blazon: Azure, arising from waves of water Argent in base, a round tower embattled Or, masoned and embrasured Sable, on the top of the tower a flagstaff of the third, flying therefrom the Union Flag proper. 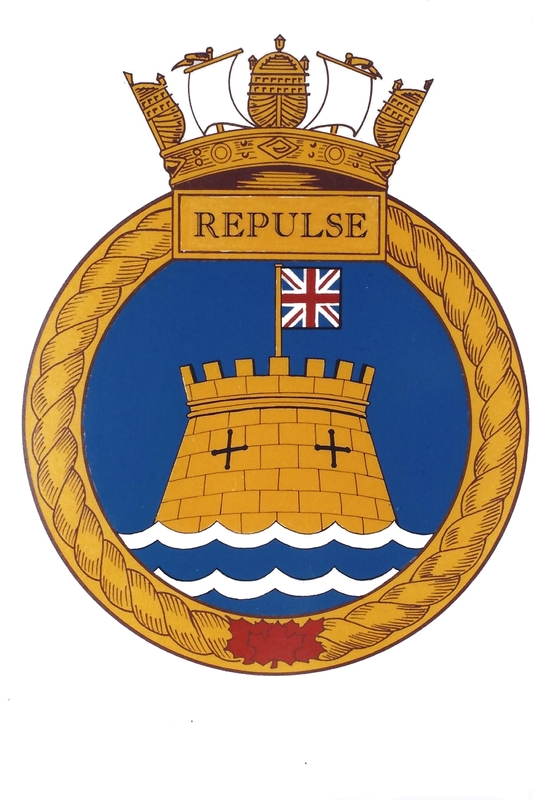 Significance: The badge is that of HMS REPULSE. The design symbolizes the island of Britain, able to repulse any assault.